To order a bag of Made by Dede, simply click here to send me an e-mail with the product name or description and any other comments or preferences that you might have. You will receive an email first with price and more information and later on an invoice and payment details by email. Together with your bag, you will receive a paper invoice as well. 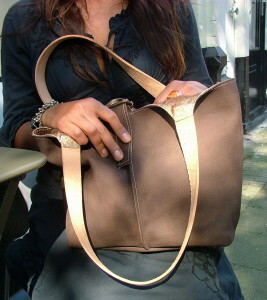 Made by Dede makes unique bags, therefore it is not possible to order a bag that already has been sold. However, if you see a sold bag you like, please contact Made by Dede and tell me what kind of bag you would like to have. Made by Dede can make a bag specially designed for you so you have your own very unique bag! After ordering your bag, you will receive information on payment by email as soon as possible. Payments for bags should be done in advance. The bag(s) you ordered will be shipped after Made by Dede received your payment. The bag of your choice will be reserved for you until 14 days after the email with payment information has been sent. If you do not pay in time, you order will be cancelled. Payment for special orders (bags that are not offered on this website but specially made for you) will be done on agreement between Made by Dede and the customer. Shipping of bags will be done only after full payment has been received. Prices are exclusive shipping and handling. Shipping costs for a standard parcel of 0,5 – 2,0 kg within the European Union amount to 11,55 EUR. Please note that rates may further vary depending on order size and destination (check information at TNT Post). For exact shipping and handling costs, please see the details in the invoice that you will receive by email. If you have any questions, please feel free to contact me by email: info@madebydede.nl. I will do my best to answer your questions as soon as possible.